I love my freaking Kindle. I love to read and I average about 70-100 books a year. If I had physical books for all of that reading, it would take up way to much space in my little house. I will admit when I read physical books, I would re-read things much more often then I do now. But on the other hand, with the Kindle, I branch out from my normal genre a lot more often. I think its because I am less afraid of not liking it and having a book sitting around that every time I see it I am like, "ew, I hate you." (I have very strong feelings when it comes to books). I understand the bazillion people who are against the Kindle and everything it stands for. They say they hate the loss of 'turning a page' and enjoy the feeling of holding a book. I understand that there is nothing like the smell of a new book, or walking into a book store or library and spending hours searching and reading and the comradery of being in the same space of others who love books. But I feel like there is Kindle replacements for this. Goodreads.com gives you a place to enjoy books with others. The feeling of your ol' trusty Kindle that's been through how many doctors office waiting rooms with you, entertained you on beach days, and sat up late with you while you read; that replaces the feel of a physical book and makes you not even notice the supposed loss of page turning. Nothing though makes up for when your Kindle dies while your in the middle of a good book and you have to sit and wait while it charges. That's just horrible. I love my Kindle too! This is my third one, actually. I still read physical books, especially if the eBook is overpriced and I can borrow the paper book from the library. But reading on the Kindle is much more convenient. (Sometimes, even reading on my smartphone is more practical than reading a book!) I care more about the story than the smell of paper. I love my kindle too and for pretty much all the reasons you listed! I haven't read anything on it for a while though, mainly because I have so many unread physical books in my flat and want to make a dent in them. It's so easy to just add more and more books to my kindle but at least then I don' see them sitting there unread. 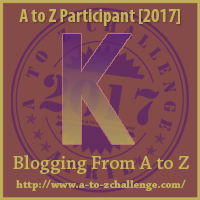 My A-Z theme is my Favourite Things and there's a bit of nostalgia today as K is for Kim Possible. I don't own a Kindle, but I'm glad there's an app for it. I have it on my Android. ^^ And, yes, it's very useful even though I have enough books to keep me busy for the rest of my life. I'll always love holding books and basking in that bookish smell, but I do appreciate ebooks for the immediacy they offer. One-click books, why not? Sometimes I'm just WAY too lazy to drive to the library or way too broke for the book store. I'm still more of a book person overall, (I prefer the term "classicist" to "Luddite") but I also have the Kindle app on every device I own - and it gets used on every one of them as well. Really, how can you hate anything that lets you read at any time, even when you didn't think you'd need to?